Some hangovers take more than a good night’s sleep to get over. It’s been three years since the global economic crisis put an abrupt end to emerging Europe’s credit boom, but neither lenders nor borrowers are in much of a party mood. One key reason: many of the loans so readily dished out before the crisis have now gone sour. Festering bad loans are a problem on many fronts: banks, credit supply, economic growth, and people all suffer. Take Japan’s lost decade. There too, a credit boom ended in tears, new lending subsequently went from too much to too little, and a vicious cycle of credit squeeze, declining asset and collateral values, and economic paralysis followed. In emerging Europe, the share of loans classified as nonperforming—many of them household mortgages—have exploded from 3 percent before the crisis to 13 percent at the peak. 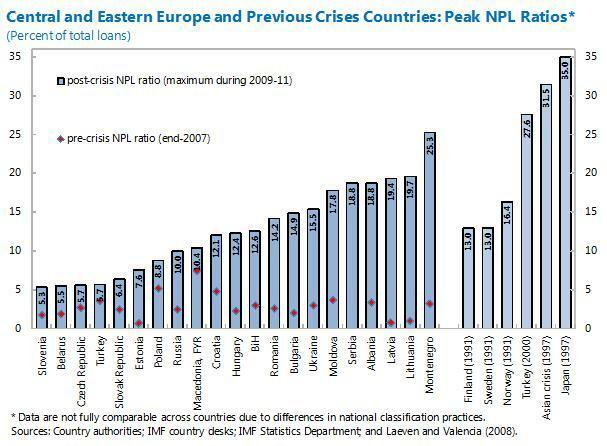 As can be seen in the chart below, levels in some parts of the Baltics and Balkans are already at par with previous financial crises elsewhere. Nobody wants this dire script to replay in emerging Europe. Policymakers, bankers, and international financial institutions therefore got together under the Vienna Initiative to identify ways to tackle nonperforming loans. A working group co-chaired by the IMF and World Bank just presented a report that analyzes the problem and offers a way out. Our analysis finds evidence that nonperforming loans are indeed a serious drag on credit supply and economic growth. They drive up banks’ funding costs and interest margins, and at the same time drain their profits and capital. On the credit demand side, over-extended households and businesses are reluctant to consume and invest. But can banks afford aggressive loan resolution, and would higher credit growth even be desirable in a region that just went through a massive credit bubble? The analysis provides comfort on both fronts: even if nonperforming loan resolution brought new losses to the fore, financial stability would not be undermined. And despite the credit boom, the private sector’s debt-to-GDP ratio is still low in most countries, so a resumption of credit growth wouldn’t be a problem. If speedy loan resolution is in everyone’s interest, why is it not proceeding faster? The working group identified two key obstacles. First, there is a collective action problem. Individual banks neglect the positive side effects that accrue from resolving these loans, including on collateral values. Unless their competitors do the same, they are not keen to book additional losses at a time when they face multiple regulatory and liquidity challenges elsewhere in Europe. Rather, banks might “extend and pretend”—roll over debt service in the hope that loans will become performing down the line. Second, moving bad loans off banks’ balance sheets, foreclosing on delinquent creditors, or seizing and selling collateral isn’t exactly easy in Europe’s emerging economies. Legal, judicial, tax, and regulatory systems are often poorly equipped to deal with insolvency and to facilitate efficient restructuring. The best way to overcome the deadlock is a concerted push by policymakers, bankers, financial regulators and supervisors at the country level. Banks should step up the work-out of these loans, often with help from their more experienced Western parent institutions. Writing down unrecoverable loans shouldn’t be a taboo. Local banking associations are well-placed to generate the momentum needed to overcome the first mover disadvantage we mentioned above. Policymakers have a long to-do list, depending on each country’s circumstances. This includes creating—often from scratch—regimes for insolvency and out-of-court restructuring; designing tax regimes that don’t punish debt writedowns and loan-loss provisioning; and ensuring that bankruptcy courts have sufficient resources. The working group also identified some do-nots: governments should avoid heavy-handed intervention such as extended foreclosure moratoria or mandated debt writedowns. Such measures backfire by undermining the payment culture and contractual environment—a deterrent for much needed new lending. Financial supervisors need to step up pressure to accelerate the resolution of bad loans. Ever-greening, overvaluation of collateral, and underreporting must not be tolerated; adequate capitalization and provisioning needs to be ensured. Regulatory obstacles, such as constraints on banks to own real estate or establish special vehicles to manage these loans need to be removed. Finally, banks’ home and host country regulators should coordinate their actions closely. The International Monetary Fund, World Bank, the European Bank for Reconstruction and Development, and the European Union can do their part by providing international coordination, such as under the Vienna Initiative, and technical assistance. Emerging Europe’s debt hangover will not be cured by a good night’s sleep. But if all stakeholders work together, the recovery will be shorter and less painful.